Should Ni no Kuni II Have Kept the First Game’s Familiars and Been More Like Pokemon? First off, I want to say that I absolutely adored Ni no Kuni II: Revenant Kingdom. It was magical, delightful, the most feel-good game I played in 2018, and so on. My feelings are absolutely in line with our review, however I did find myself missing one aspect from Ni no Kuni II. That’s the familiar mechanic found in Ni no Kuni: Wrath of the White Witch. In a game that stood out for many reasons, it had an equally unique combat system. The combat of Ni no Kuni II, felt much more standard, if more efficient, than its predecessor. Would Ni no Kuni II have benefited from retaining the combat system from before? True, Ni no Kuni II added a ton of new systems, from the kingdom building to the skirmish battles. Maybe adding the familiars would have been one step too far. But in a game that was often called “too easy,” it could have been just the thing to add another layer of strategy. 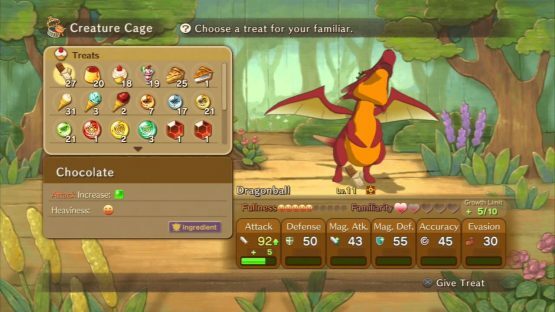 Throughout the world of Ni no Kuni, you could tame some of the monsters you fight in combat, a la Pokemon. I would’ve loved to see Level-5 refine the mechanic a little bit more for Ni no Kuni II, rather than dropping it altogether. It’s no secret that Pokemon is one of the most popular and financially successful entertainment franchises out there, gaming or otherwise. Maybe, just maybe, if Level-5 thought about not giving up on the poor familiars, we could’ve seen Ni no Kuni become a true “Pokemon-like” for the PlayStation platform. 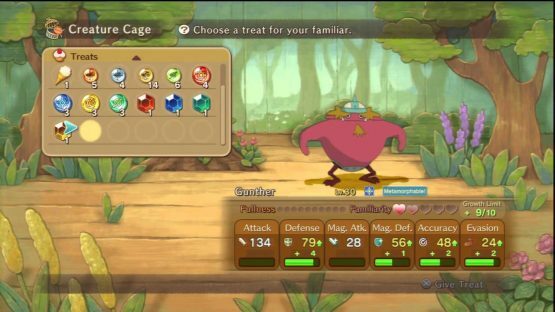 However, the beauty of the Ni no Kuni familiar mechanic isn’t that it’s an outright Pokemon clone; really, the only thing in common is the use of creatures in combat. For starters, it has a real-time combat system, which immediately sets it apart from the Nintendo staple. There are also some added complexities that create some added strategy. While there is a similar rock-paper-scissors mechanic in place for battles, there is another twist. Each party member works best with certain types of familiars, making you think hard about what characters should get what creature. For example, the Thumbelemur familiar you acquire in the narrative works best with Swaine, who doesn’t join your party until much later. When you do get Swaine, the familiar he comes with isn’t even compatible with him; he’s much better suited for Oliver’s party. You can give our familiars treats that boost their stats, an element adopted somewhat in Pokemon. Even the “metamorphosis,” which is essentially an evolution of sorts, involves some strategy. When your familiar changes, it reverts back to level one, meaning you need to think hard about when you should make the change. For the final stage, you actually had your pick at forms. As each form offered different benefits and drawbacks, it was another tough decision. It looked like Level-5’s objective was to take the standard Pokemon formula, but make it just that much more complex. Some may find the added complexities unnecessary and point to Pokemon’s simplicity as the reason for its success. That may be true, but there are some who do want a more complex Pokemon-esque experience, and the PlayStation 4 may be the perfect home for that. 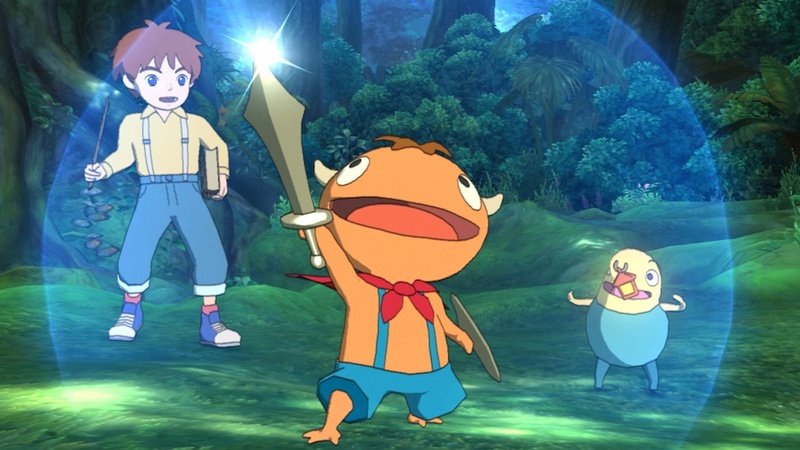 However, Level-5 decided to go for a more standard action-RPG approach for the Ni no Kuni sequel. You can’t fault the developers for that decision, but it’s hard to not wonder what could have been. Now, that’s not a knock on that at all. The combat of Ni no Kuni II is fast, efficient, and there are some elements of strategy present throughout. However, using the familiars in combat helped Ni no Kuni stand out from the beginning. Maybe making the mechanic a series staple could have helped it carve a nice little niche for itself on the PlayStation ecosystem. Ni no Kuni II is a great RPG on its own, but I would’ve loved to see the predecessor’s excellent system refined.